Premium Compatible Label Tapes for the Dymo LabelWriter 330 Turbo printer. The Dymo LabelWriter 330 Turbo label maker is a dedicated compact machine designed for trouble-free label printing. The printer makes use of thermal technology for printing. This eliminates the need for toners, ribbons or ink cartridges. The printer comes in silver and red housing. It measures 9.3 x 8.8 x 5.6 inches and weighs 1.59 kg. So this makes the printer an easy fit machine on a user’s desk. This labeling machine comes with USB and serial ports for connectivity. A power supply is needed to make the printer work. The LabelWriter 330 has a simple yet modern design. On the front part, it has a single indicator light. This printer can handle tape widths up to 2.3 inches. The labels delivered by this label machine are crisp, clear and professional. The printer offers a maximum print resolution of 300dpi. Use of Dymo LabelWriter 330 Turbo label tapes makes the printing easy. It prints very fast, taking about five seconds to produce a label with print speeds of up to 32 labels per minute. Printing from computers is straightforward with this machine as it contains a standard software. 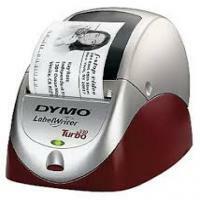 Dymo LabelWriter 330 Turbo labeling machine delivers high quality and professional labels. The print speed is impressive. This label printer is compact as it takes up little space. However, it would be better if it had Wi-Fi connectivity. Q. Does Dymo LabelWriter 330 Turbo printer is able print in colour? A. No. The Dymo LabelWriter 330 Turbo printer is not a colour printer. It can only print in black and white colour. Q. Hello. I have heard that the printer comes with its own software. I want to know what are the benefits? As I want to buy this printer. A. The Dymo LabelWriter 330 Turbo printer incorporates its own label software. So you can customize your labels before printing. In addition, the software automatically captures addresses from various programs. So you don't have to waste time typing them out before you print them. Q. Why should I select the Dymo LabelWriter 330 Turbo Label Tapes to use with this printer? A. The Dymo LabelWriter 330 Turbo Label Tapes are specifically designed to be used with this printer. With these tapes, you get high quality professional labels. Also, the text quality is crisp and clear. The Dymo LabelWriter 330 Turbo label tapes gives out print with use of thermal transfer technology. So you get ease of use with these tapes as there is no need of ink or toner cartridge. Q. Hi. I want to know if the Dymo LabelWriter 330 Turbo printer is easily portable? I often have to move from one place to another place. A. Yes, this printer is easily portable machine. The printer weighs approximately 680 grams. This makes it lightweight and easy to use. So you can definitely carry it out from one place to another place. Q. Can I create different styles of text on my Dymo LabelWriter 330 Turbo label tapes? A. Yes, The printer supports more than 40 standard label sizes up to 2.3 inches (56mm) width. This includes address, file folder, disk, shipping, postage, name badge, video, cassette, and many more. So you can easily create different label styles on your Dymo LabelWriter 330 label tapes as per your needs. Q. I want to print date and time on my Dymo LabelWriter 330 Turbo label tapes. Can I do this with the Dymo LabelWriter 330 Turbo printer? A. Yes, you can print date and time with the text on your label tapes with this printer. You can select from a variety of date formats, including European formats. You can set the time and use the 24-hour time format and also control the font settings and other attributes for the datetime details. Q. I am an office user having heavy labelling needs. I want to buy these label tapes in bulk. So buying more number of packs would be a better deal for me? Please suggest. A. Our Dymo LabelWriter 330 Turbo label tapes are available in different packs viz. 1pack, 5 pack and 10 packs. If you have heaving labelling needs, then buying the label tapes in more no. of packs would definitely a great deal. As these are more cost-effective than single packs. Q. Can I use this printer for professional use? What is the print resolution offered by the Dymo LabelWriter 330 Turbo printer? A. The Dymo LabelWriter 330 Turbo printer offers high printing resolution of 300 dpi. So you get the high quality texts. You can surely use this printer for your professional use. Q. What is the shelf life of these labels? Will these labels fade easily? A. In its original packaging, the label shelf life is 18 months. When labels are used for short-term applications fading is not an issue. When labels are utilized to label files in a file cabinet, fading is very slow over many years. To increase the label life when not in use, keep the labels stored in a cool, dry place and in the black bag in which they were dispatched.